Arbor is a multifamily lending company that partners with clients to customize financial loan solutions. Beginning as a single family lender, Arbor has become one of the nation’s leading multifamily lenders. Closing 1 in 8 home loans, Arbor grew their roots by planting a tree for every new homeowner they worked with. Arbor approached us to display their national presence by refreshing their brand, and building a new corporate website. The goal of Arbor’s typeface was to compliment their new logo and shift their brand in a more contemporary direction, while maintaining the level of professionalism they have established in their industry. Ultimately, we chose Montserrat, a bold sans serif that conveyed Arbor’s industry leadership. 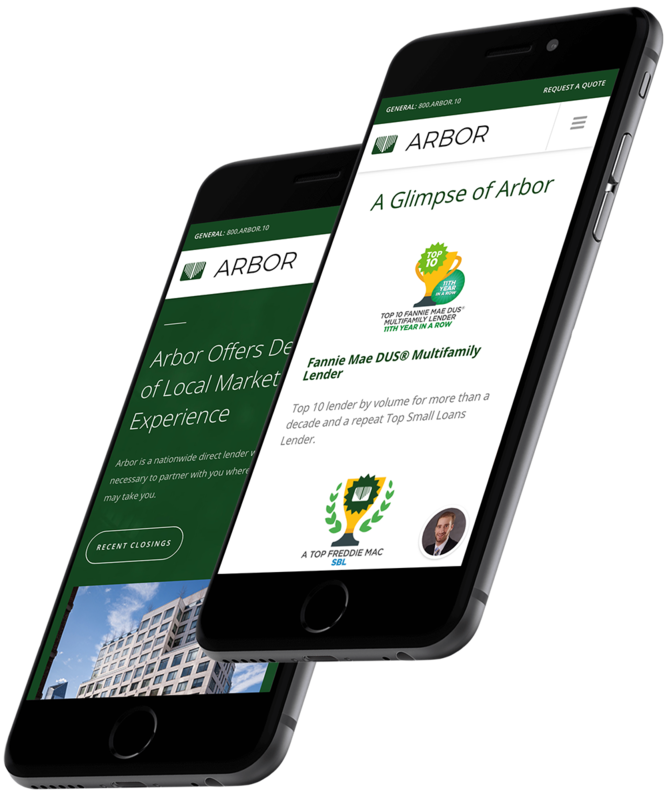 Arbor approached us with a goal of displaying the growth of their national presence by refreshing their brand and building a new corporate website. 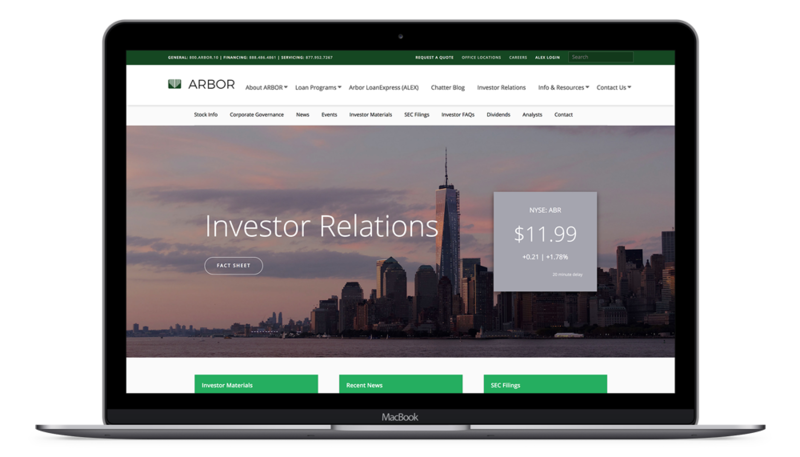 Our website redesign aimed to successfully position Arbor before their various intended audiences including investors, senior facilities, retail facilities, and multifamily property owners. 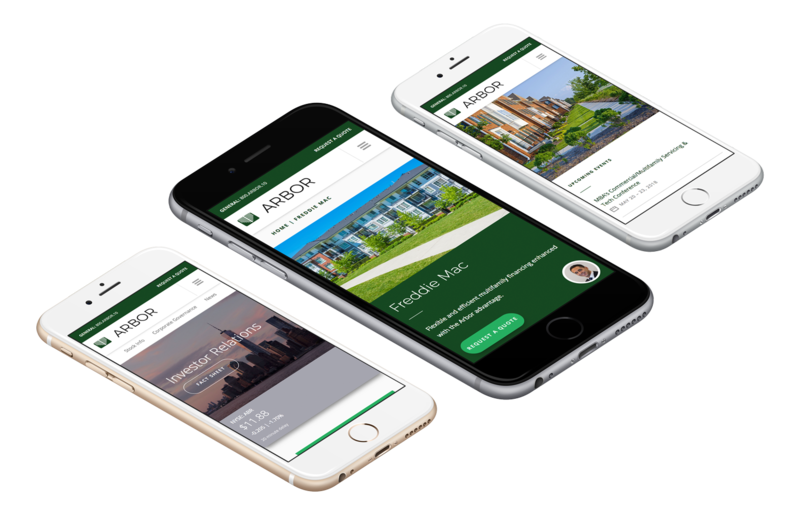 We set out to build a robust, user-friendly website with sophisticated search functionality to reflect Arbor’s widespread presence. Together, our teams anticipate driving additional traffic to the website, and increasing organic lead volume. Seamlessly connecting all other segments of the organization, we built a robust, user-friendly website integrated with the company’s loan application platform (ALEX), CRM, stock feeds, financial calculators and all recent closings in real-time — establishing Arbor’s corporate site as a hub of information for various target audiences. With additionally created entry points, site users can more easily connect by requesting a quote, calling, live chatting, or scheduling a meeting with the expert originations team. Arbor’s corporate website has been engineered for success. Our teams look forward to seeing an increase in loan applications, organic leads, career applications, and a more engaged online audience. We are proud to have helped properly represent Arbor for the nationwide direct lender powerhouse that they are.